Thanks very much for the great workshop in Calgary. It was a lot of fun and very worthwhile. Attached is my effort at Robbie. And it's some effort, Ken - very worthwhile! Robbie the dog is looking good - plenty of three-dimensional form and texture, although perhaps a little over-textured, because in trying to depict detail I think you've lost some of the impression of him being a black dog. His coat appears wooly rather than black and shiny. However, it does no harm and adds to his character, as does the glint in his eye. The broken eggs are nicely displayed, and I like the way you've weeded the ground below him to better display the fallen egg. 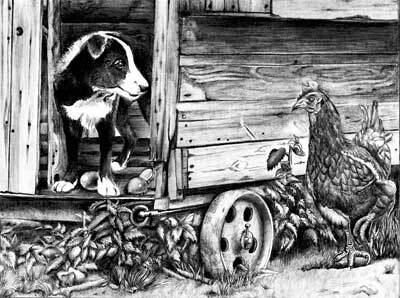 Possibly a darker interior in the henhouse would have forced you to use more intense blacks within Robbie and added more depth to the drawing, but the two balance well as they are. The wood of the henhouse looks old and rustic without attracting too much attention. I really like the way you've used the angle of the cast shadow that falls across it to lead the eye directly to the hen's head. And you've used the wood well to make the hen to stand out from of it. Henrietta herself is excellently drawn. She has believable feathering and very good three-dimensional form, due to your bold use of contrasting tones. She also looks appropriately displeased!. The foliage is good if a little lacking in detail, but as you've pruned it heavily it does its job quite adequately. 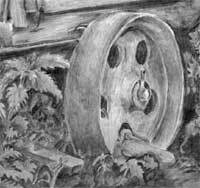 The rusty wheel is very well studied. I like your use of broken line to suggest age, wear and imperfections. And your ellipses are perfectly formed. The foreground is admirable and that piece of old wood on the ground serves to subtly swing the eye in an arc between Robbie and Henrietta. The broken ground and small clumps of grass are nicely judged, both to ground the hen, and lead in the eye without attracting the viewer's eye away from the two main players. And the highlighting of Henrietta's feet is commendable in bringing to our attention the only movement in the composition. It adds a lot to the story. I'm very pleased with this and I hope you are too! I am saying this is finished. It has taken me a long time and many tries but I am pretty satisfied with it. Thank you for teaching me so much in such a short period of time. 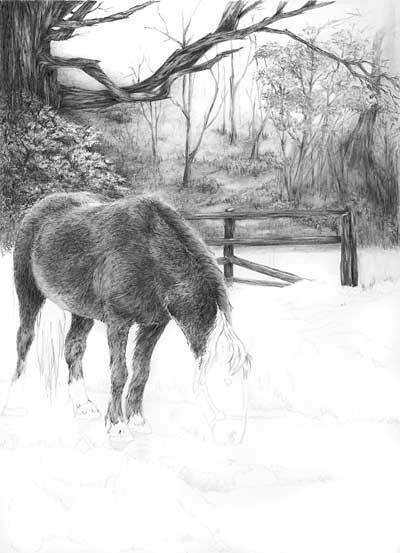 If you feel this is done then it's done - and I applaud you for not wanting to fiddle with it :o) Fiddling almost always results in a muddied drawing, so it's best to leave it and carry lessons learned with you to the next project. 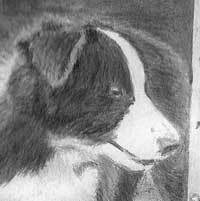 Robbie the dog is looking wonderful - alert and happy with a solid sense of three-dimensionality and texture. 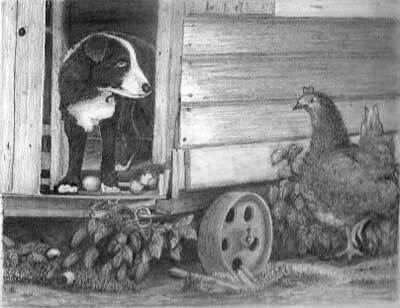 The broken eggs are perhaps a little lost - here I think a darker interior to the henhouse would have added depth to the drawing and contrasted with the eggs, making them more visible by emphasising their highlights and light interiors. The wood of the henhouse is very well judged tonally. It had a solid feel about it and an excellent sense of old weathered wood without it being a distraction. You've also used it well to allow the hen to stand forward of it, which was one of the major problem areas in this composition. 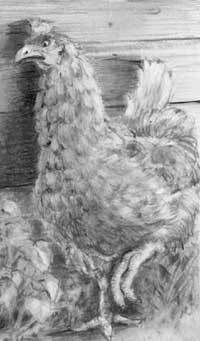 Henrietta the hen has a very believable covering of feathers and good three-dimensional form. The drawing of her head could have been sharper - that would have made her stand out from the wood even more and increased her presence - but it's drawn well. From the centre right the foliage is good - sharply defined with good form and detail. The foliage in the left half is less well defined. That doesn't harm the drawing very much, but it's lack of sharp edges vies with the expectations of the viewer - foreground elements require clarity. I like the broken tones of the rusty wheel. They add character rather than texture but overall it reads well and that's what really matters. And your foreground is well judged too - it leads the eye in and grounds the hen without it taking attention away from the two major players. You should be very pleased with this! 22:09 04/08/2015 Thanks, Bill. We enjoyed meeting and working with you too. And Duncan the mini-donkey is now settled in and enjoying life. He's a real character! I think this is finished too - time to move on and take with you what you have learned. Overall, I feel this is lacking a feeling of depth, but individual elements are well-drawn. Robbie the dog has character and presence with his mischievous grin, and he has a good three-dimensional feel about him. I particularly like the way you have his left shoulder forward and his right receding, giving a real sense of place in space. 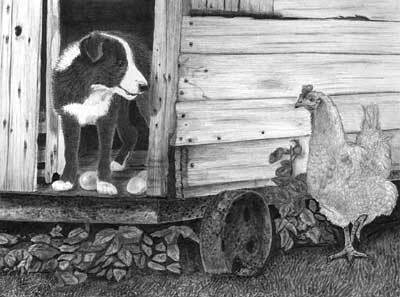 The henhouse is well drawn with attention given to small details. Unfortunately the tones you've used for the ground are very similar, which flattens the right-hand side of your drawing. You've made good use of that shadow cast by the hen, but you've missed one golden opportunity. The shadow appears to lie almost flat as it climbs the adjacent foliage. You could have used that shadow to really emphasise the three-dimensional appearance of the weeds, by breaking up its edge to describe the layers of leaves. Henrietta the hen has a good grumpy appearance although her eye has been simplified and has no focus. Leaving a prominent highlight within her eye would have been preferable to just leaving her iris white. Without shading it appears to be a little flat and lifeless. She is definitely feathery and has some semblance of form. Your foliage does its job without being detailed. It adds a feeling for the environment without drawing much attention to itself, and there's nothing wrong with that. Overall, I think you've done well and just need to think more three-dimensionally as you work. I think you've excelled yourself - not just with the result but with your inventiveness. I said from the outset that you should make this your drawing and not mine, and you've certainly done that! Robbie the dog has such presence and character. He's definitely up to mischief and thoroughly enjoying himself. He has good texture, three-dimensional form and that lovely glint in his eye. The henhouse works well - decrepit, much repaired, and very woody without it once becoming a distraction. And your chicken... Well, I think you did a superb job - especially the use of that bold cast shadow that helps to balance the drawing and increase the hen's prominence. She has such a delightful look of menace in her eye! And she has good three-dimensional form and a very believable feathery body. The use of highlights on her raised foot serves well to draw attention to it. 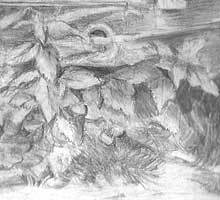 Your foliage, although less well-controlled than other areas of the drawing, does its job well by suggestion alone. It doesn't, as you remarked, add much to the study but it does add a natural feeling of "place". It's an area the eye can glance across and receive sufficient information to satisfy it, and that's all that is required of it. Overall, I'm very pleased with this and I think you should be too. Here is my completed workshop drawing. I'm struggling to get the fine detail in the foliage. Sharpness around leaves and stems seems to be elusive. Any Suggestions. I don't see that you have a problem with edge sharpness. Your foliage is quite high contrast, which might be giving you problems, because Nature is more subtle. 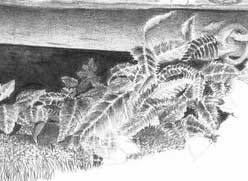 With high contrast evident, it may be that your detailing of the foreground leaves is being made difficult - making subtle detail appear weak so you are forced to exaggerate. One leaf in particular stands out (marked by the arrow) because it contains a very believable surface texture and detailing. I should also mention that you seem to achieving depth by the use of darkness (leading to the high contrast) rather than establishing darker midground foliage and even darker background foliage. Your drawing itself has many fine points. The dog is definitely centre stage and looking alert and pleased with himself. 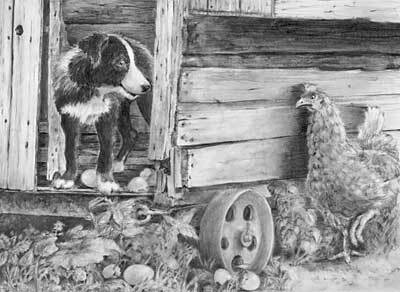 You've done a remarkable job of getting the hen to stand out from the henhouse wall - she shares importance with the dog, which is as it should be. 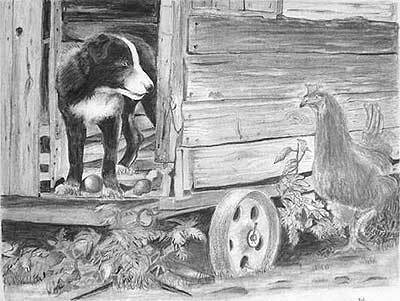 There is an apparent error behind the dog - there is light wood between his front legs, yet that degree of light does not exist elsewhere in that area of the henhouse. And there is a white patch between his legs that appears to have not been drawn at all. 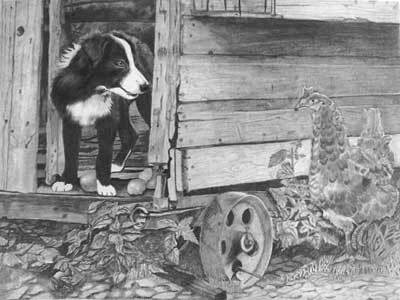 Again it is far too light for the situation - as is the dog's rear paw that, being shaded by the dog's body and being inside the henhouse, should be darker than his front paws. The wood is not overly dominant and definitely "woody". And your foreground serves its purpose very well - grounding the hen, leading the eye in and not being intrusive. Very well done, Jay. Thanks again for the wonderful workshop. It was a joy to attend. I'm attaching my finished final project. Please provide any feedback that you feel relevant. Thanks again. This is a very creditable rendition. Robbie definitely takes centre stage and (which is a difficult feat) the hen shares the limelight. The glint in Robbie's eye and his shining white hair draws my eye directly to him. His gaze, as intended, direct me to his right where the hen in unmistakable. It's so easy to lose the hen against the wood of the wall behind her but, with your sharp drawing and use of dark key areas, you've given her a real presence. The grass works well, if a little dark, but the weeds and wheel please me less. The wheel is not correctly elliptical, and that always looks unnatural (even if it's only slightly incorrect). 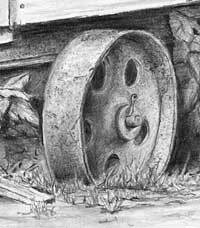 It would have done no harm for the wheel to have been lighter, as it would have put a temporary visual barrier between our two soon-to-be-feuding opponents. The same is true of the weeds. They look good but, on closer inspection, lack a degree of depth. There are dark depths, especially within the weed to the left of the wheel, that would have benefitted from having mid-ground leaves established in the shadows. 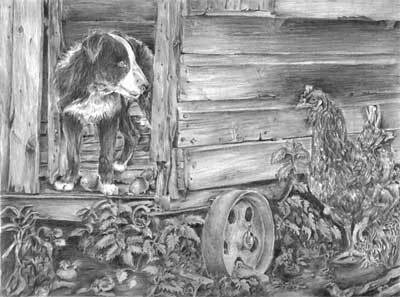 All the foreground leaves throughout could be showing lighter tones and more highlights, which would have restored the balance, as currently Robbie and the hen greatly dominate the drawing. A little mystery is never a bad thing. Overall, I think you've done an admirable job and I can see many areas where I believe you were truly engrossed in the study, producing areas of detail that I'm convinced came not from the reference but from your mind. Long may that continue! I am posting you my finished drawing for your critique and would be grateful for any comments you make. Thanks for a wonderfully informative weekend and I look forward to a follow-on course and DVD in the future. I've adjusted your photo to what (I hope!) is more like the original. I think you've produced a very polished and solid drawing. "Solid" because that's the way it appears to be - especially the wood, which has an overall unity. It has just sufficient detail to read as old weathered wood without any of it vying for attention with the principle players. I like you choice of dark tones and minimal detail for the interior of the henhouse. It gives depth to an otherwise flat composition, and frames Robbie the dog very well. Robbie's rear foot bothers me - it's too bright and white for its shaded position. But the rest of Robbie is superb! He has good three-dimensional form and hair texture, and I feel I could pat him - he has that much presence and reality. The ellipse of the wheel is slightly out, but it's sufficiently played down for that not to be a problem. I like the cast shadow of the nettles on its rim. Good touch! It shows you were living within the scene as you drew. The weeds do their job well. The eye can explore them if desired, but they remain secondary to the main characters. And their random nature adds a lot to their appearance of reality. 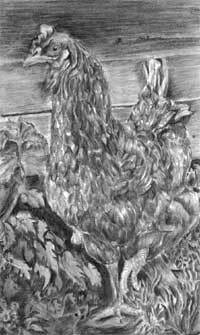 Henrietta the hen could really do with a few key darks to draw in the viewers eye. She's not as prominent as she needs to be. You could emphasise her three-dimensional form too by increasing the contrasts used in your choice of tones. 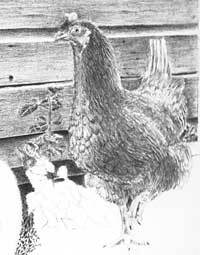 She's a well drawn hen with believable feathering but darker shadows would increase her modelling and presence. Her head, in particular, needs to be sharply defined, as it shares equal importance with Robbie's in telling the story. Stronger tones in her head, a few well-chosen blacks, sharp drawing, and the lightening of the wood behind her should make her pop forwards and attract attention. But that's just my opinion - it's your drawing. I prefer your foreground on the right, because it's less busy and distracting. But that piece of wood by the wheel is a great invention! It perfectly leads the eye in and directly to Robbie. Overall... well done on keeping control of a deceptively difficult drawing. You should be very pleased with this! Thanks again for the excellent workshop! It was extremely helpful, I really understand the negative drawing now. I was just wondering if you could critique this drawing. It's my first commission after your workshop. I'm having troubles with the nose and chain, any suggestions? Very few suggestions, Ashley, as I think it's an admirable drawing, and I particularly like the use of negative drawing to create the highlights on the top-most layer of hair. Sometimes we expect too much of ourselves and at others we are so engrossed in a drawing that we can no longer see the overall picture. Overall, in this case, I'd be a happy client to have received this. The eyes have a lovely lively look, but on closer inspection I suggest you use a little more subtlety when drawing the iris's flecks and striations. They're not wrong, just a little coarse. The nose doesn't worry me much at all. It has form and texture and, in time, I think you'll develop your skill and be more tightly controlled. The texture is a good suggestion but not a faithfully rendered surface. The leather on most breeds tends to be divided into misshapen islands with valleys in between. Depending on the scale of the drawing (I don't know the size of this) that means either drawing individual islands, with associated highlights and shadows, or suggesting something close to that. In this case I think this nose was brown, so the texture would not be as noticeable. Your rendition is not far off the ideal at all. What was troubling you with the chain? It's accurate and underplayed - exactly how I would personally prefer to see it. Good job - and an excellent use of maximum contrast in the eyes that really pulls me directly to them. I'm finally making some progress on the composition you worked up for homework using Thomas. I'm really enjoying the challenge! I've had to exercise my artistic licence quite a bit in the background area because I can't see too much detail, but I'm finding that it's lots of fun to create my own world. I had an especially rough time with the ivy on the tree, so I went with the idea of putting a bush between the horse and the tree. I imagine that I'll be lifting much of the detail in the background with Blu-Tack after I've developed the foreground." I'm posting both the earlier stage and the current one, Laurene, because I find it interesting to see the development. "Artistic licence" is definitely required with this study! I photographed the background probably about 25 years ago and the photo itself is gradually fading. But I saw that as a bonus when I was composing the study, because it forces you to improvise and interpret rather than copy. So you're definitely hading in the right direction. I think the result here is excellent. You've achieved good recession, thanks to the bold drawing of the tree, and if necessary you can push he background further into the mist with Blu-Tack at a later date. You're tacking this in a way that allows full control over the final appearance. Incidentally, I love the rough bark and harsh angularity of the tree - it might contrast very well with the smooth and round contours of Tom's body. I'm glad you're enjoying this - ultimately that's all that really matters. I made a little progress. 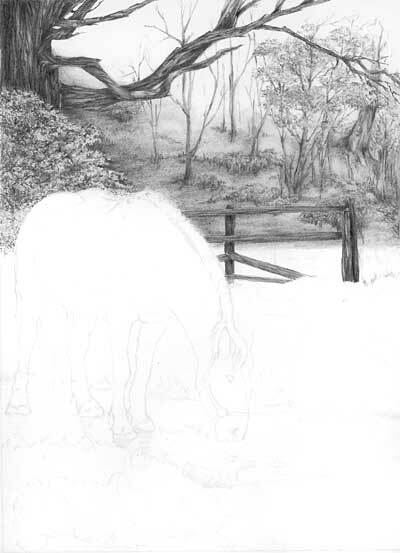 I worked on Thomas' coat at least enough to guide me as to what to do in the background and especially what to do about that bush that I placed between the tree and the horse. I felt I needed to push the bush back and also to make it less of a perfect sphere (that just didn't work with the rest of the landscape). I think it's better now but I think it still needs to be less conspicuous." Tom has got a truly believable three-dimensional form, and great hair texture. He had his winter coat when I photographed him, which I think gives him more visual appeal. I think you've broken the outline of the bush very well - it now has an enhanced feeling of reality. And don't worry at this stage about it possibly being intrusive. Personally, I tackle such problems in two stages. First is what I term the "detail layer", which you have established. That's the reality established and the hard work done. Next comes the "tone" layers, which are applied as overall layers and used to progressively push the bush back into shade and decrease the internal contrasts. You can do that in stages - gradually, as you feel the need, and towards the end to determine the final balance. In this case I'd leave it until very late in the drawing, when you have enough drawing completed to make rational decisions. And, of course, the tone layers can be progressively removed with Blu-Tack to bring it forward again. Used carefully, Blu-Tack can adjust the tone layers without affecting the detail layer beneath. Think in terms of relative sharpness for the remainder of the drawing - the nearer the viewer, the sharper the drawing, which will add depth by contrasting with, and enhancing, the hazy background. I think I've gone as far as I can go with my homework now. The dried grass in the foreground is not as fine and detailed as I'd like but it's becoming quite difficult to erase so I think it's time to stop. Thanks for the challenge, Mike. I was definitely working outside my comfort zone here, and I enjoyed trying to convey a sense of depth of field as well working on all of the different textures." This is wonderful! There are so many potential problem areas in this composition and so much you had to interpret and invent, given the poor references, that I'm delighted with the end result. The sharply defined foreground grasses work well to suggest depth, and swirling nature of those on the far bank suggest the directional flow of the water. Breaking the fence at the right was something I've not seen done before with this study, but it allows the eye to travel back into the scene that, being of a softer nature, doesn't vie with Thomas for attention. It's a secondary visiting place that permits you to roam at leisure. The recession you've achieved in the background works perfectly, as the does the suggestion of a path. I feel I'm being lead gently on the route you prescribed but able to step to either side if I wish. I have a slight problem with Tom's rear hooves, which are unnaturally white and don't, as I'd expect, reflect in the water. That said, Tom has a solidity of form beneath his winter coat that I find very believable. And the contrasting smoothness of his head draws my attention directly to him. I am so pleased you attempted this, and with the excellent result! I really enjoyed your workshop and the friendly atmosphere. I am attaching my finished drawing, could I please have your comments. Hope your wife and yourself are in the best of health. There's some good work here, and a couple of areas that don't succeed quite as well. Robbie the dog is looking splendid! 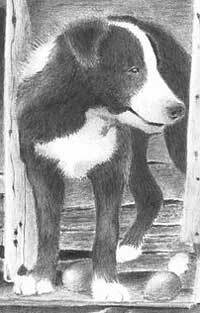 Good coat texture, a truly believable three-dimensional form, and a sharp, bright eye that give him that essential character. The wood of the left hand door is looking good, but I find the right-hand wall to be a bit distracting. It contains light streaks and too much contrast and I think it would benefit from a lightly-applied overall layer of HB or 2H. That would remove any white content and reduce the contrast while maintaining the detail. Wood often benefits from just a suggestion of grain. 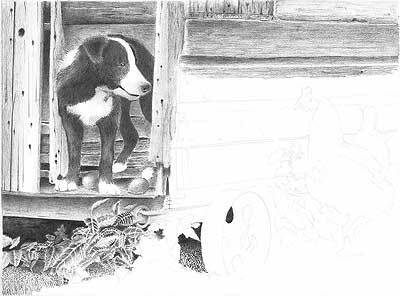 As it's a secondary element of the drawing, I would personally remove the highlights on the wood, as I described, and darken the interior of the henhouse behind Robbie's back legs. Not much light will enter far into the interior, as it is mainly blocked by Robbie's body and his cast shadow. Your foliage is sparse but believable, which is all that matters. It has depth and variety too without attracting the eye directly to it. The hen has a realistic covering of feathers but I think she lacks both form and presence. Her head and raised foot are the two main elements, but they should be drawing our attention to themselves, which they fail to do. With more diffuse wood behind her (as I suggested) this is an ideal opportunity to use very sharp drawing. The contrast of sharp against soft drawing should make her pop forwards. You can reinforce that by including, or inventing if necessary, a few dark details in her head. That will give her some visual impact and increase her importance in the drawing, which is necessary as she is one of the two main elements of the story. The wheel is very good, with near-perfect ellipses and a credible non-reflective rusty surface. And the gentle highlight on the top reinforces its three-dimensional form. Overall, apart from the slightly lost hen, I like much about this. Well done! I'm in the process of doing Chico...no whiskers yet and being light on the shading...but it's a start. Any critique welcome! Cheers and thanks again for the Canada workshop. I had a great time in Ottawa...looking forward to next year's! I'd forgotten you were doing your Chico as the final workshop drawing... I've corrected your photo to what I believe is close to it's true self, so keep that in mind while I critique. This is definitely heading in the right direction. Chico has good three-dimensional form and a believable hair texture. I like the depth you've achieved in the ears - those dark shadows at the base really work well to separate the inner ear from the head hair. Good negative drawing used too in those areas. The eye highlights work well, although I think the eyes are looking in slightly different directions. 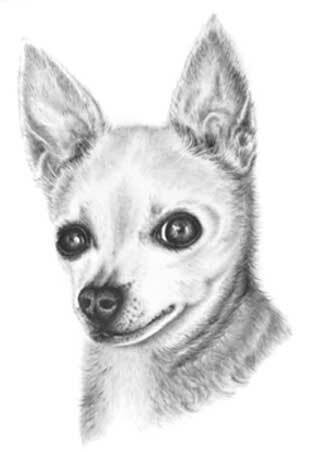 This a three-quarter view and the right-hand eye is looking directly at the viewer, which means Chico is looking very slightly to his left. But the pupil of his right eye is looking directly forwards. It's entirely possible that he looks that way in real life, so don't make changes unless you agree. If necessary, a correction should just entail moving his pupil to the right and probably repositioning the highlight slightly higher, which would also make the eyes appear to be more similar in size. I think you're doing a good job with this study and I'd welcome seeing it again once the whiskers are in. Bob, this is looking wonderful! Robbie the dog's coat has a superb and accurate hairy texture (he was only 12 weeks old when I photographed him), he has a lively glint in his eye, which is very important to the simple "story", and I love the shaping of his front legs - proper knees! That's not easy given the lack of detail in the refs. Your wood is looking good - suggestive of grain yet played down - it should be, as it's a secondary element of the drawing. I would personally remove the highlights on the wood in the interior of the henhouse below Robbie's back legs. That area is in deep shade and in Robbie's own shadow too. Logically not much light will enter that far into the interior. You might then have to tone down Robbie's back foot, but that will aid recession and give more depth to the drawing. Your foliage, which I guess you're working on now, is well drawn, although I think it will later benefit from an overall layer of 2H or similar to tone down the white content. It's a little too high contrast at present. You might consider leaving the extreme foreground until last. That's my personal way of working, because I can use that area to balance the drawing, lead the viewer in and to make certain it's not too busy or distracting. Finally, before you continue to work your way down the right-hand wall, make some decisions about how you are going to treat the hen. 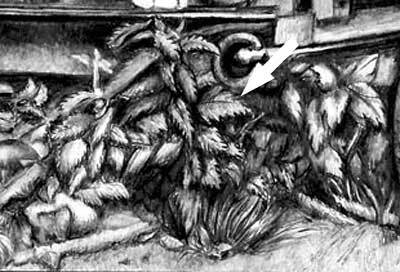 It's important that she stands out and is prominent in the drawing - her head at least and that raised left foot, both of which add more to the story being told. I have not applied all the recommendations you suggested in the first critique. I am feeling my way through the process to establish the overall tone for the composition. This is progressing very well, Bob, and I don't think your tones will differ much from those you finally choose. 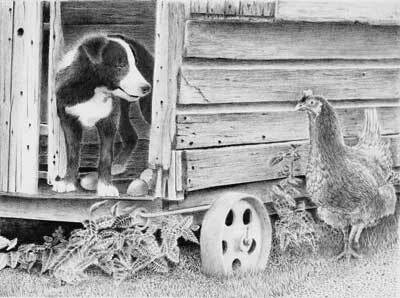 While I stress that this is your drawing and not mine, I would have darkened the wall above the hen. That structure above her is a projecting nestbox (you may have seen the original photo of the henhouse at the workshop) and it casts a shadow. I'd use that shadow to dull the contrast and interest above her head, so the viewer's eye is more readily attracted to her. The hen herself is looking good - especially given the rather vague reference photos. She has good three-dimensional form, sufficient suggestion of feathering, and a necessary presence. I think I might find a way of making her beak more prominent - perhaps by introducing a highlight and dulling the white in the board behind it. You might also consider working out a way of emphasising her raised foot, as that is the only real movement in the piece and a definite part of the simple story. Keep drawing - I'm enjoying watching this grow! I hope your US tour went well and you are still thinking about coming back to Canada. PEI is a wonderful place"
Unfortunately, Bob, I've had to postpone Canada until 2012. I've just got too much to do next year. I have followed your advise with darkening the inside of the hen house and underneath the egg nest. There is a lot more tweaking I could do but I have to say finished. As always your critique will be greatly appreciated.I am calling this 'The Egg Poacher' Best to all! Thank you. My first reaction (I place a lot of importance on that) was WOW! I really like this! Almost everything works wonderfully well. Robbie and Henrietta are definitely the main characters, the henhouse has a lovely sense of solidity about it that doesn't draw the eye, and the grass is equally as good. Getting Henrietta the hen to share centre stage with Robbie is a particularly difficult job with this study, but you've achieved that admirably. Robbie possesses such a great sense of three-dimensional form and texture - among the best I've seen, especially given the poor references. I accept that your scan has lightened the wheel and that doesn't bother me at all. It's round, it does its job, and in fact its lightness of tone serves to increase the contrast in Henrietta, which definitely helps her to stand out. The grass, as I said, works very well but the weeds, in my opinion, less so. This is a case of less is more but you've given it more than it required. As a result it has become over-detailed, difficult to understand and is an unwanted distraction. Individually, the detailing of the leaves is superb, but overall I find it too fussy and lacking a realistic depth. If you study Nature - a clump of weeds, for example - you'll quickly realise that the foreground leaves are easily read and understood, those immediately behind offer a partial understanding, but behind those nothing can be understood and the whole shaded mass is assumed to belong to the plant. It's that lack of understanding that gives the realism. Overall, I think you've done a superb job, and you've kept control of a subject that is full of potential problems. Well done indeed! My completed drawing from our workshop. I personally do not think that the scan does it justice but I'm obviously biased. Anyway I would really appreciate your comments, especially regarding leaves and foliage as I seem to have not perfected the technique despite a number of attempts." First, Paul, I've attempted to return your scan to what I perceive to be it's true tones, so bear that in mind while I critique. 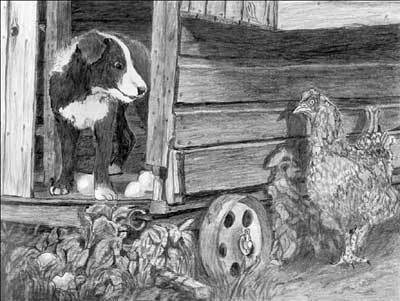 Personally, I find the left hand side works better than the right, because the hen (who contains half of the story) is not as strongly drawn as the dog. 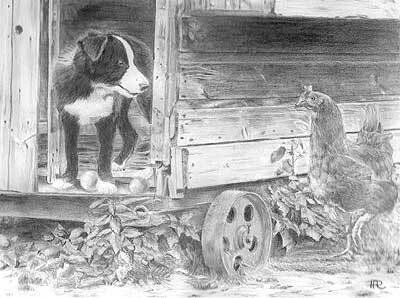 I would have liked the interior of the henhouse to have been a little darker, to give more depth to the drawing - especially between the dog's rear legs, where the light unnaturally enters the henhouse as far as the rear wall. Just because light appeared in that area in the reference doesn't mean you have to include it. With the dog now in position you have to make allowances for its shadow and ability to block light from entering. 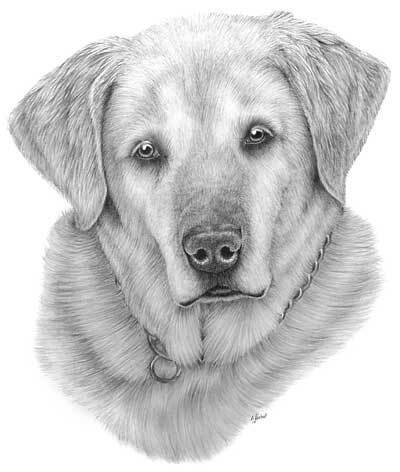 You've done a very good job with the dog, given the sparsity of detail provided. He has good three-dimensional form, an ear successfully lifted clear of his head, and a believable hairy texture. 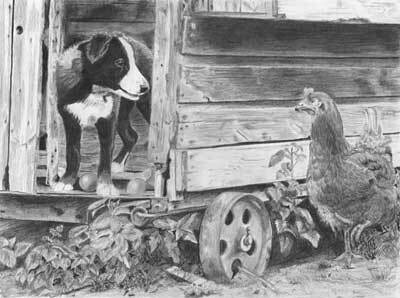 The highlight in his eye works very well - giving him character, drawing attention to him, and pointing the viewer to the hen. Your rendering of the wood is excellent. It has a feeling of age, and I can almost feel the grain beneath my fingertips. You've also nicely reduced the strength of tone in the lower right-hand side, which should make the hen easier to emphasise. The hen has a very realistic covering of feathers without any being too overt. As her head and raised foot are the two main elements, a suggestion of feathering is, I think, what was required, and you've achieved that. She has good three-dimensional form and the highlighting of her raised left foot draws the viewer's eye to the only movement in the composition. Her head, however, should be drawing our attention to it, but it fails to do that. She has a solid black pupil but her dark iris misses the opportunity to use maximum contrast to good effect. With the softer drawing of the wood behind her, this was also an ideal opportunity to use very sharp drawing. The soft/sharp contrast would have made her pop forwards, as would the inclusion (or invention) of a few well chosen dark details. High contrast (of tone and sharpness) would have given her head visual impact and increased her profile in the drawing. She is, after all, one of the only two main elements of the simple story. The wheel does its job well and has a believable rusty, non-reflective surface. That hint of highlight on the top of the rim nicely reinforces its three-dimensional nature. I can see you had problems with the weeds. They lack definition and, I'm sure, an understanding of what you were trying to achieve. Outline the foreground leaves (as I showed you) to isolate them and then build the shaded background piece by piece, beginning with the intense black deep shade. With that shade in place, the other tones should more easily fall into place. 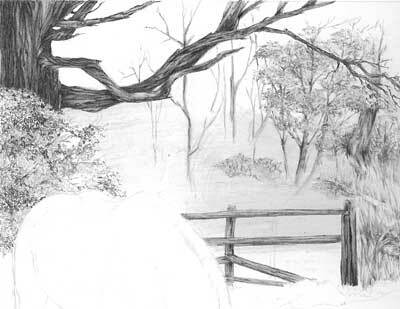 Then, with the background completed, spend time on carefully drawing the isolated foreground leaves. It's these leaves that the mind responds too and then assumes that the "foliage" behind belongs to the same plant. Your weeds lack depth, because both the deep shade and midground shaded leaves are missing. And the lack of highlights in the foreground leaves removes any real contrast. Study plants in real life and photographs and you'll better understand what was required. Finally, your foreground works very well to draw the viewer's eye into the scene, suggesting a dusty area with clumps of grass that don't themselves attract attention. I like the fluid, loose style you've used in that area, especially around the base of the wheel. You've used it to good effect too in grounding the hen. I think you've done a good job with a study that contains relatively difficult elements. It doesn't quite work as a whole but it's close. 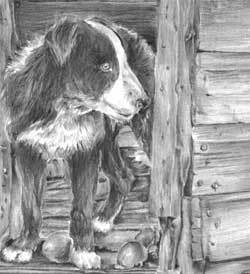 Thank you so much for the weekend up in yorkshire 2010. what amazing talent you have at drawing. I would very much like to follow in your footsteps some day. Here is the picture I have been hard at work on. Do you think the hen needs to be darker or lighter or not to touch it? Friends and family like it very much. What do you think I should do next? Good work, Alice. And what to do next? I'd call it "finished" and move on. You risk overworking it if you continue. Overall it works well but it could be improved. I would, for example, have liked the interior of the henhouse to have been much darker, and with less distracting rubbish on the floor. Just because they appear in a reference doesn't mean you have to include them. A darker interior would have framed the dog and boosted his presence. That said, you've done a very good job with the dog, given the sparse detail available. You've successfully lifted his ear clear of his head, and he looks hairy, alert and interested - score three out of three! Your wood is excellent. A lovely feeling of age with realistic nail heads and splits, but without them becoming distractions. I really feel you experienced the textures as you drew them, and that makes such a huge difference to the success of any drawing. The hen is very nicely feathered and has a good feeling of three-dimensional form. And the lighting of her raised left foot captures the only movement in the piece. However, her head should be drawing a similar attention to itself, but it's a bit lost in the background. Here, less and softer texture in the wood would have helped, as would a lighter tone. 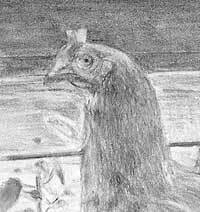 That would have allowed you to use sharp drawing and a few choice dark tones in the hen;'s head to give it impact and immediately attract the viewer's attention. Your weeds at the left hand side look good, but they are too dark overall. In fact the whole drawing is relatively dark and lacks a balance of lighter tones. Here those light tones (and gentle shading) would have added highlighted surfaces to the leaves, increasing the feeling of three-dimensional depth in each clump. Because the generally dark tones used you've been forced to use similar tones for the fallen eggs, which are barely noticeable. The ellipse of the wheel is slightly inaccurate at the base although it's not too noticeable. But the rusty, non-reflective texture works very well. The foreground is perhaps a little busy and distracting. I personally leave that area until last, so I can use it to balance the whole and not draw the eye down, and usually mere suggestion is sufficient to lead the eye into the drawing. Element by element this is a very good attempt, but they just don't fit together as well as they could do, because your attention to detail and overall use of bold tones causes them all to vie with each other for attention, to the point where the story is almost lost. I have enclosed my completed drawing started at your recent Vancouver workshop. Overall I think that many of the techniques taught at the workshop have found their way into the drawing - how successfully perhaps you can offer an opinion. 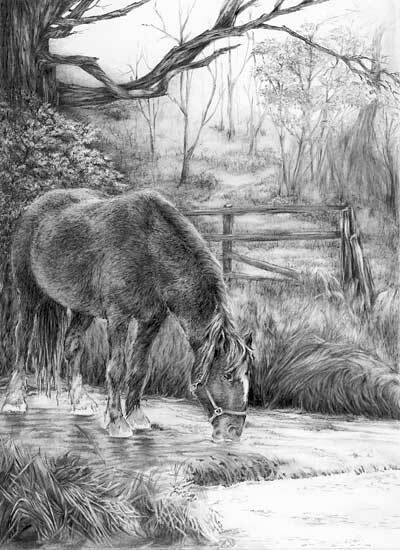 I found the workshop to be one of the most rewarding experiences associated with my favorite hobby - drawing with pencil. Having purchased your book a year ago I found the workshop nailed down many of the lessons contained in the book. I also wish you the best of luck with your planned DVD's - you can be sure I will be one of your first customers. Well done, Mike! 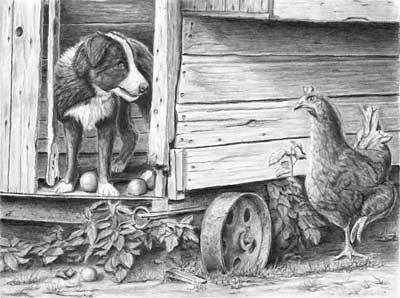 Even though the hen is in partial shade, your subtle highlighting of her head draws attention to her, as it should - she and the dog are the two main elements of the story. And the lighting of her raised left foot captures the only movement in the pierce. Let's start at the back and work forwards. 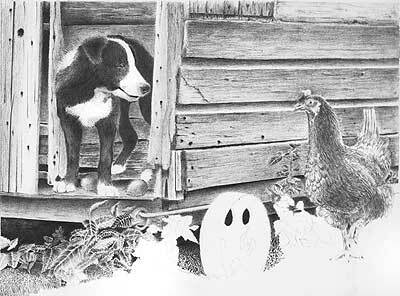 Your relatively dark interior of the henhouse works well, adding depth to the drawing without overpowering the dog. The dog looks hairy and black, and you've done a good job of lifting his ear clear of his head. The hen has a good solid feeling of form, and, in my opinion, just the right suggestion of feathering. The drawing of your wood is good with a believable and subtle texture. It's so easy to over-detail such a secondary element, so you did well to avoid that. The foliage at the foot of the henhouse is, in my opinion, somewhat weak and despite efforts to make it more distinct I was unable to do so. I decided to stop before I ruined it. I suspect that the dog and the chicken could also be improved. Your weeds at the left hand side look good, although the fallen eggs are possibly just a little too noticeable. Sometimes it pays dividends if you allow the viewer to find some elements later. And I suspect your use of grass, rather than weeds, caused you the problems you state. Such clumps of grass need careful study before commencing with them. It's so easy to stylize unless you have a clear idea of the true growth habits in your mind. The rear ellipse of the wheel is not fully accurate - something that is always readily apparent to the eye. I'm not certain what the shapes below the wheel represent, but they are slightly distracting. Often less is more in a foreground situation, which why I personally leave that area until last, so I can use it to balance the whole and not draw the eye down. Overall, a very good attempt, Mike.